A came into my room early this morning, told me it was nearly six, and asked if she could get up. “Yes, of course, ” I said, “but I’ll get up in a bit.” Not five minutes later she shrieked “I need you!” and would not tell me why until I appeared in the kitchen. A little mouse had fallen into an empty wastebasket and was desperately trying to jump out. So I covered the wastebasket with an old copy of Cook’s Magazine, and together we took the poor mouse outside and put him (hoping he’s a he) in the garden. If you save a life . . . . that’s more important than sleep. As happy homeowners, you can do something to close up those mouse entry ways. 2. Fill larger gaps inside your home with pieces of steel wool, as pests are deterred by the roughness of the steel fibers, especially rodents who are unable to gnaw through the material. 3. Screen attic vents and openings to chimneys, which could serve as potential entryways. 4. Replace weather-stripping and repair loose mortar around the basement’s foundation and windows. 5. Properly landscape around the home to avoid providing pest harborage sites. Keep shrubbery trimmed and ensure mulch is kept at least 15 inches from the foundation. 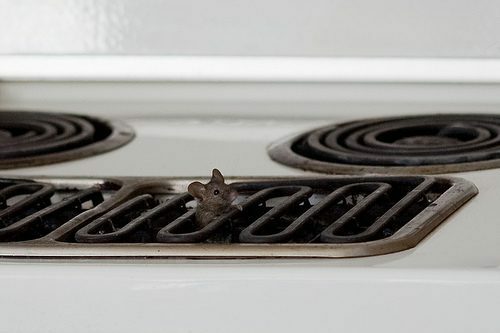 In the Northeast, 35 percent of homeowners report that they have had a mouse or rat problem. 45 percent reported that mice where in the house during the winter months. 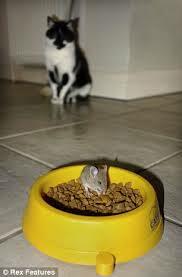 While I am on the topic of predators, it is pretty well established that getting a cat is no assurance that you won’t get mice in your house.